This week I have been talking about different activities to do with your kids while they are home for spring break. So far we have made rainbow pasta, excavated dinosaurs from ice and opened a coffee shop. 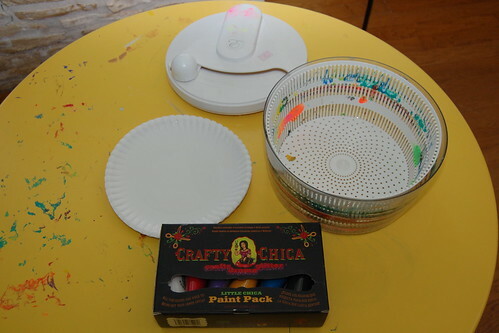 Today for I Love to Create I decided to bust out the paper plates and salad spinner I scored at the thrift store. Ever since I saw this idea on Pinterest I could hardly wait to find a salad spinner at the thrift store. 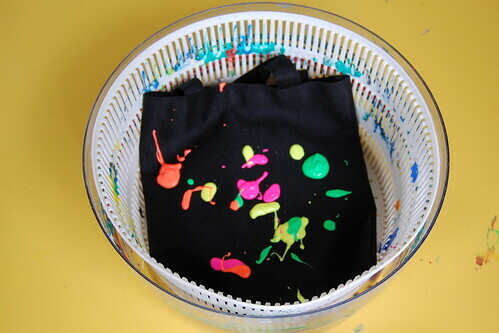 I have been making spin art on everything I can fit in the basket: 7" records, small black tote bags and more. For Tallulah I thought I would go old school and use paper plates. 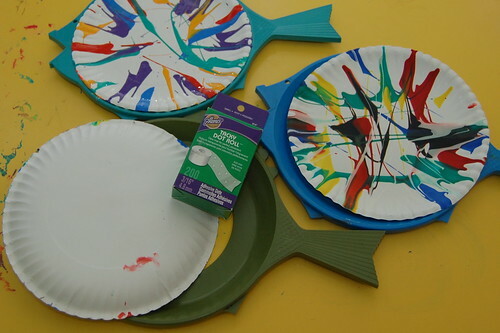 The first thing we did was squirt paint randomly onto paper plates. 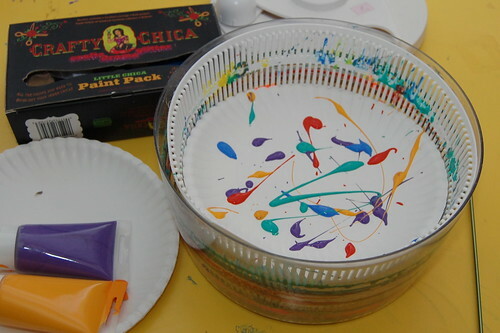 I used Crafty Chica paints and Tallulah stuck with her kiddlet paint. Needless to say - Tallulah was in charge of all spinning. 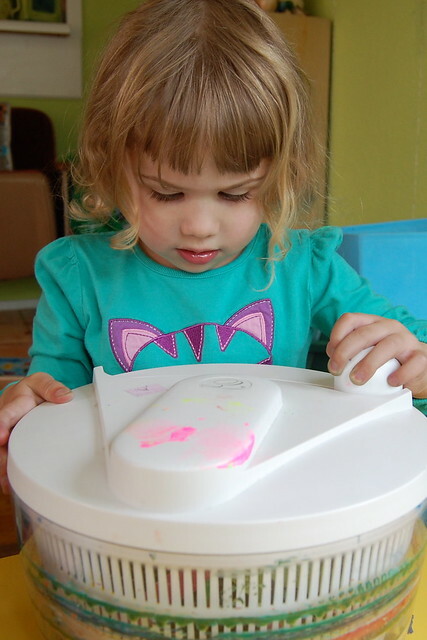 She loved watching the paint splat on the sides of the bowl. It was her happy accident that she got water on her plate before it entered the spinner. I think watering the paint down makes for a more interesting blurry effect. 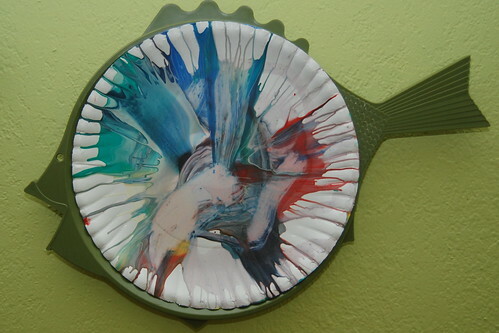 The plates looked so cool when they were done I wanted to somehow display them. 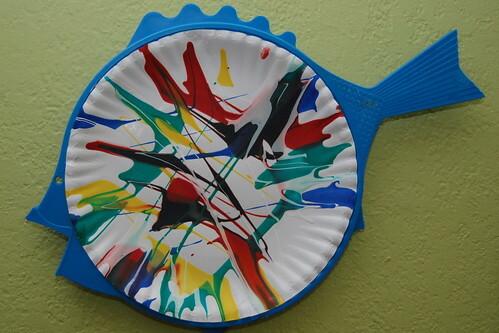 Hanging paper plates on my walls is not super high on my list. 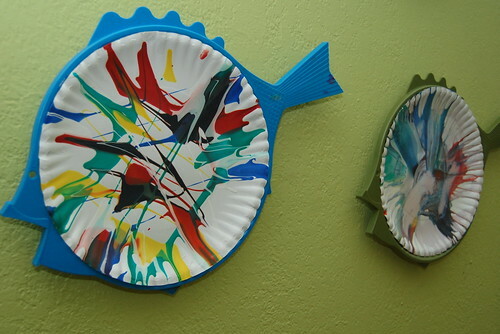 Coincidently on the same trip to the thrift store I scored some vintage fish shaped paper plate holders. I thought they would make great frames for our new art. I used Tacky Glue Dots to attach the plates to the holders. 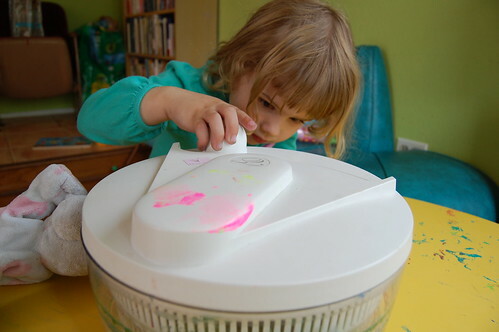 Making spin art is way more fun than de-watering your clean lettuce! I'm not saying I am going to leave these hanging on my walls forever, but at least until the end of spring break.